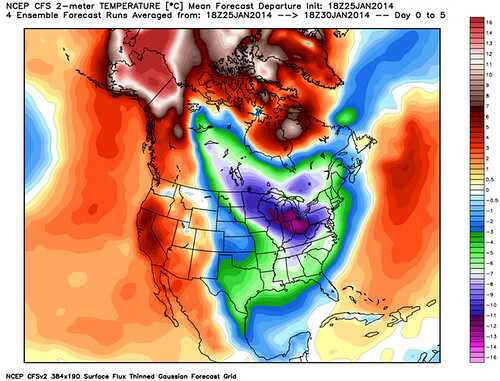 There's a lot to get to in this week's State of the Atmosphere as we head into the last days of January. Let's begin with an update on the big weather changes we discussed yesterday for Denver on Sunday night and Monday. All-in-all, the forecast appears to be on track. Today will again be warm across the metro area (though not as warm as Saturday) ahead of much colder air due in tonight. By Monday eastern Colorado will be under the grip of bitter cold arctic air, with highs only in the teens for most locations and overnight lows in the single digits. This shift in temperature is all part of a bigger shot of reinforcing cold air that will bring another round of double digit, below zero temperature readings to a good portion of the upper midwest. 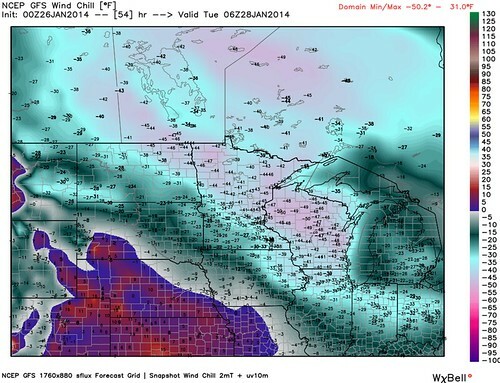 The 00z GFS brings -50 degree F wind chills to much of Wisconsin by Tuesday night (left) with all but a handful of states seeing temperatures well below normal by Tuesday (right). Jet Dynamics. This element gets thrown around a lot, but what's important here is that with a strong jet aloft, we can get good banding to set up which will 1) often lead to snowfall totals well above advertised, and 2) often be highly localized in nature. So, for instance, if we forecast a broad-brushed 1 to 3" and by chance a jet induced banding sets up correctly, some locations could see several more inches than their neighbors. This is extremely difficult to forecast for! Moisture. What the models haven't convinced me on is moisture. We'll have plenty of cold air, and with a jet roaring above good lift, but all models Saturday lost some of this key ingredient. We'll see how things trend today. Given all this, there is a certain degree of uncertainty with this forecast. Trends have been up over the last 12 hours nearly unanimously, and with that we will go with slightly higher totals than we would have 24 hours ago, but keep the Bust Index medium high to account for uncertainty. For Denver, we're going to broad-brush 2 to 4 inches of snow Sunday night through Monday night, with higher amounts possible where banding sets up. Expect the snow to come in waves -- the initial push tonight, and potentially another round of heavier snow Monday evening. The caveat here of course, is that these numbers really might change, so stay in touch as we head into tonight. As we have been advertising for several weeks now at Weather5280, the last days of January appear to mark a shift in the dominant pattern that has controlled weather across the United States for some weeks. 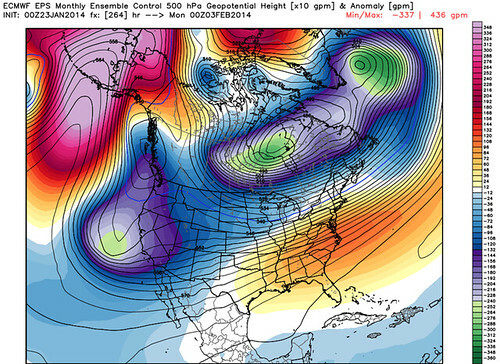 While it's too soon to nail down specifics, it does continue to look like the first week of February will be much more active in the west as a ridge of high pressure begins to break down. In fact, there's some indication more unsettled weather will be header our way later in the week. 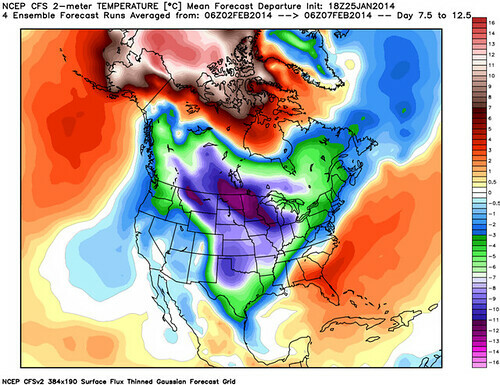 Take a look at the next five days 2 meter temperature anomalies from the CFS (left) and then the follow 10 days (right). First notice the cold keeps coming for the U.S., but with more blocking up over the top, the brunt of the cold air shifts further west than where it will be this week. 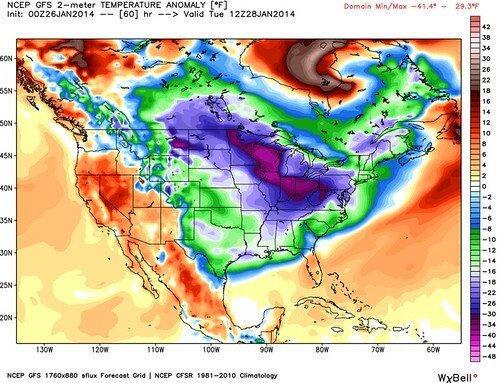 It would be the first time in a long time we see below normal temperatures for California. Now, while none of this is a forecast, and certainly not a promise for cold and snow, we want to relay what we are looking at for the longer term. Agreement is by no means locked in yet, and forecasts more than a few days out are hardly reliable, but from where we sit right now it appears that February will be much colder across the west than January was (compared to normal), and maybe even a bit more active. For what it's worth, while not consistent, both the GFS and European model's have been trying to bring much more cold and snow into Denver over the next 16 days than we have seen this winter. Much more to come on our more immediate focus with snow earlier this week, subscribe here to stay ahead of all the changes.